Your black and white photography is truly exceptional! Fantastic work and very good to see you walking some new roads. Incredibly stylish gallery; I'm not always a fan of monochrome but with this gallery it seems just perfect! still doing a great job, everytime i take a look a pleasure ! strange, strong and nice ! v ! Brilliant work as always Richard !!! Fabulous mise en scene and outstanding performance. Big vote! They all look great in this setting. Well done for an outstanding series! a collection of masterpieces... amazing! V! Wow, amazing gallery Richard! something really beautiful to look at. Congrats on everything you do here and your books look wonderful. Fantastic work again my friend! BIG VOTE!!! Technically and artistically brilliant. That bar that was already as high as it could go has been raised yet again. Brings the phrase "Dancing on your grave" to new heights! A wonderful gallery, Richard! Wonderful photography: the dancers, moments, lights, and the range of grey tones. V.
A new varation with ballet dancers. Amazing photos Richard !. It must be an hell of a job to get this done. Wow, these are just stunning. The girls are very talented but to capture them like you have is an amazing talent.V. 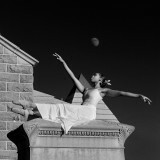 Lively art of the dancers and silent art of the stones compose this splendid series!Compliments Richard! This is a wonderful series of B&W images. Very appropriate for the Halloween season! It looks like you and the dancers has a lot of fun with these shots. Great job by everyone involved. Awesome idea and presentation, Richard, another excellent gallery! the tones add a lot to the spirits"
Bold and imaginative concept, magical mist and light, a setting full of history.....excellent, Richard. And kudos to the dancers. Your impeccable work is a pleasure to view and adore. I am left with speechless and in awe inspiration. It's a brilliant idea and photographs (and dancers) so perfect ! wonderful collection of shots ,ther is no limit for art shows,i meen grate stage.v. You have done some great work here. Douglas Kirkland would enjoy your work with the dancers. 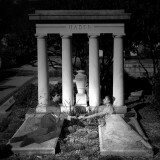 This gallery has an ominous feel to it, being in a graveyard, but celebratory as well. Sort of like the song Whistlin' Past the Graveyard. It is a beautiful dance. Really lovely work Richard, a big vote for this beautiful creative concept. V! Whow!!! These are truly magnificent, but then again you already know that the shots will be before you even click on the gallery to open it. 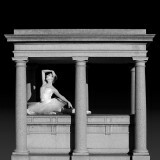 If Mr Calmes has been let out with a camera, five dancers and an unique location... the results will be ravishing. Stunning use of light, location and models. A legendary artist at work and one that does not let any of his fans down. Chapeau Richard. The Master !!! Sensational work Richard! VVV!! As always, your work is glorious! Congratulations, fantastic work as always!!! Well the ideas keep coming. Can't wait to see what is next! Another gallery of unique photos which not only make us appreciate the elegance and the talent of the dancers and the skill and the professionalism of their photographer, but make us also enter in a parallel universe of fancy and magic. The choice of black and white is very appropriate to stress the mood of the scenery and the style of the images. You are really a master in this field, Richard! What a brilliant idea this was, and as always the captures are magnificent! The processing of your images is first-rate as well. Truly the heart and soul of dancing . Richard, you made my day looking at these outstanding images! indeed, very impressive work. lights and grayscale are magic! you do not stop to impress ... lucky us!!! One more time, exquisite gallery : magnificent movments very well highlighted. Love all your new ideas Richard coming into beautiful fruition. V! Richard, this is going to be my favorite gallery EVER!